These stylish and contemporary Allermuir Casper chairs are essentially café or breakout chairs, but are also designed for all manner of other environments in both corporate and leisure markets. They have a turquoise plastic monoshell seat on a polished chrome cantilever frame. If you would like any further information, you can contact one of our sales team by calling 07944 508282. Or, If you are viewing our website using a Mobile Device, you can use the Telephone Icon shown on the bottom right hand side of your screen. Alternatively, you can enter your details into our ‘Request a Quote Online Form‘ and one of our sales team will be in touch very soon. However, if these chairs are not quite what you are looking for, we have an extensive range of other Second Hand Chairs in stock at the moment. Just click on the link provided and have a browse! 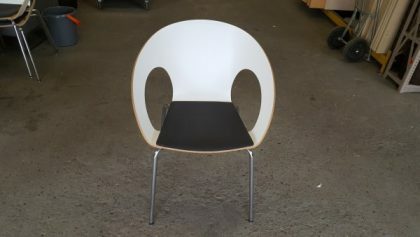 As always, you can view these chairs, along with all our other used office furniture, in our showroom.